Yesterday U.K. Prime Minister David Cameron was dubbing a Fox News commenter who had made ludicrous claims on a topic on which he was entirely mis-informed “clearly an idiot“. Today Cameron has been branded a dunce of similar proportions after making a speech calling for encryption to be banned on national security grounds. From #FoxNewsFacts to WebCameronClangers (or #CameronCryptoBollox as one tweeter put it)… How long is a day in politics! The back story here, as I wrote yesterday, is that European politicians have been calling for increased surveillance of online activity to combat terrorism, in the wake of last week’s terror attacks in Paris. This is the usual trigger response of Western politicians striving to look tough on terrorism. However the U.K. PM, who is notably on the re-election trail right now — with a General Election coming up in May — singled himself out for the most hawkish pronouncements on this front, effectively calling for a ban on end-to-end encryption. So — presumably — Cameron is calling for a ban on mainstream messaging services which use encryption, such as Apple’s iMessage or FaceTime. Not to mention PGP. He’s likely also not comfortable with consumer services that deliberately delete messages after the intended recipient has viewed them, such as Snapchat — unless they offer backdoors to U.K. security services. And what about the entire banking industry, which clearly relies on strong encryption to function? Is that going to be banned or not? Helpfully the EFF did a security review of messaging services last year. And gave gold stars to ChatSecure, Cryptocat, Signal/Redphone, Silent Phone & Silent Text (pictured at the top of this post running on the security-focused BlackPhone smartphone) and TextSecure. Such strongly secured comms services would presumably be first up against the wall in a Cameron-led Tory Britain. 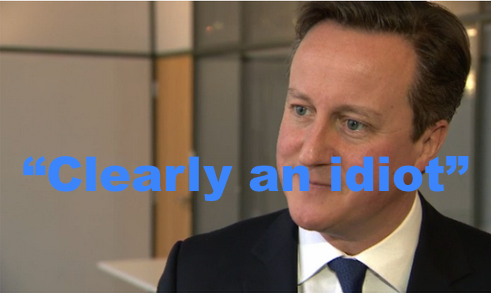 Rather he just thinks the British public is so stupid — so is making absurd claims in the hopes people vote for him. That, folks, is politics. Whatever the truth — whether he’s just blowing hot air and indulging in a spot of totalitarian posturing because he thinks being a blowhard will play well with voters in the wake of a terror attack, or whether he genuinely thinks he can outlaw maths and that that would somehow be a good thing — happily the Twittersphere did not disappoint in its mockery of his latest digital policy proposals. Heck, even Marc Andreessen called Cameron’s plan lunacy. Far for me to suggest Cameron’s comments have made him a laughing stock online — I’ll let the below tweets speaking for themselves. Politicians: The kind of people who think they can ban math. Can you imagine the number of times David Cameron used and relied on end-to-end encryption during the day he suggested it be outlawed? Hello to my British followers. Don't worry, Britain – if your oppressive government takes away encryption, the USA is ready to drop some of our freedom bombs on you. New @David_Cameron policy: replace SSL with Enigma machines, as our boffins already know how to read their messages. "I'm sorry, I can't hear you on my encrypted phone – are you British?" Not that he's got a snowball in hell's chance of preventing end-to-end encryption, anyway. Dave's tech advisers are smoking the good stuff. "If only we could break this encryption, then we'd know who to arrest for using encryption!" USA NSA: Subverts encryption standards, employs cryptanalysts, hacks the planet. UK GCHQ: "Just make everyone use plaintext." @gigaom @iothacker you'll have to pry my private key out of my cold, dead hands. @doctorow Cameron's idea is as nonsense as the Hungarian government's gigabyte based internet tax was. Which of the City banks has called Cameron and calmly informed him that banning encryption makes ecommerce an impossibility? If the second amendment were written today, it would protect the right to bear encryption.